New exterior elements include a self-drying, drain-vented fiber-cement cladding system, residential and store-front windows, waterproof decks, composition shingle sloped roofs, and double-layer modified-bitumen low-slope roofs. PL:BECS provided detailed, sequenced installation drawings to assure proper installation of all elements. 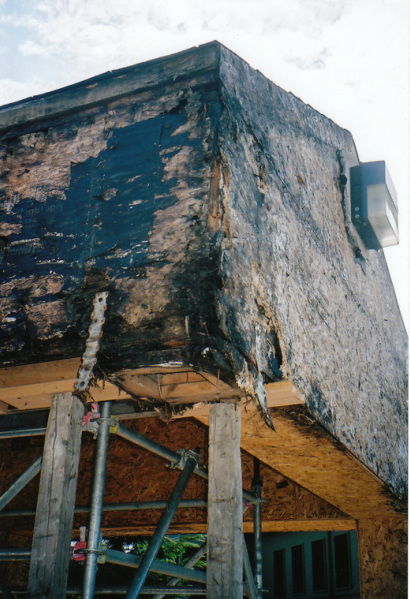 Widespread and severe fungal decay was confirmed after removal of the existing cladding. Project Summary:	This block-long, 4-story, publicly-owned retirement complex began experiencing leakage shortly after its construction only 12 years prior to PL:BECS involvement. Correction of this issue had been begun by another consulting firm, which, however, had vastly under-estimated both the problem’s severity and the scope of the needed corrective work. The existing exterior envelope systems experiencing infiltration included stucco cladding, windows, deck waterproofing, composition shingle sloped roofing, as well as modified bitumen low-slope roofing. PL:BECS Services:	King County Housing Authority replaced the previous firm with PL:BECS to provide services in three phases. In the first phase, PL:BECS was retained to provide an accurate evaluation of the extents and causes of the infiltration problems. This revealed that in spite of the building’s relatively young age, problems were both widespread and severe, and reflected systemic flaws with the original installation of many exterior envelope elements. Complete re-cladding was recommended as the only method to truly address these problems in a long-term fashion. The second phase consisted of the design of the corrective work, including replacement of the stucco cladding with fiber-cement siding, new residential and store-front windows, new deck waterproofing, and new sloped and low-slope roofing. For optimum performance and to address the client’s desire for a 50-year cladding, PL:BECS designed a self-drying, drain-vented cladding system, in combination with easily-replaceable, highly infiltration-resistant window installation methods. To assure proper installation of critical elements, PL:BECS prepared sequenced installation details for all complex junctures. Finally, PL:BECS also provided full services throughout the construction phase, including installation observation, product submittal and shop-drawing reviews, window testing, and related services. W. G. Clark Construction executed the project at an approximate cost of $ 4,000,000.